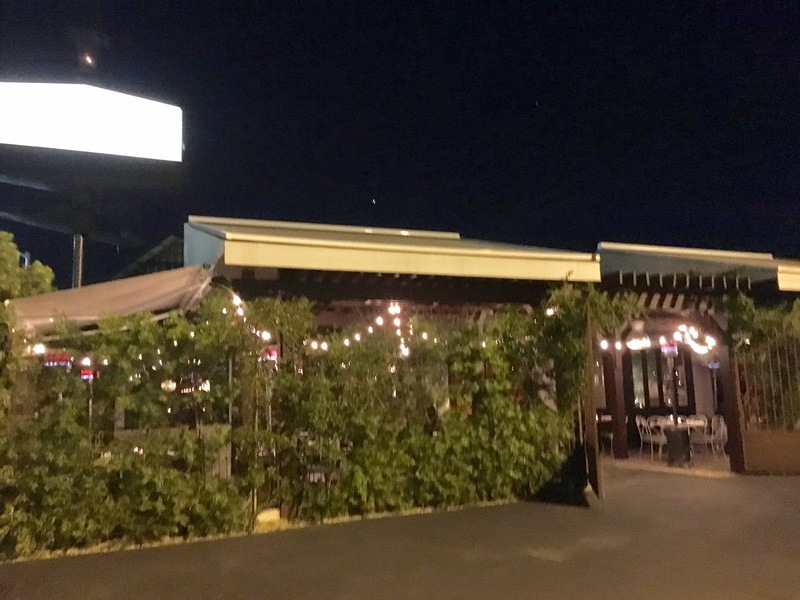 You know those farm to table restaurants that are popular in California and pretty much, throughout the States? Well, this is another one of those restaurants. 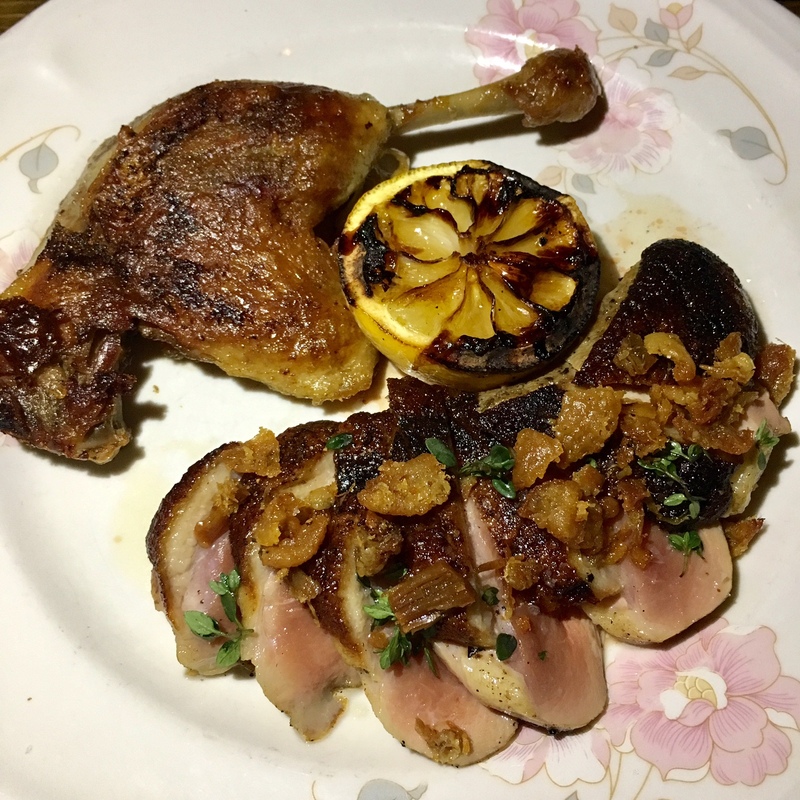 With an emphasis on utilizing fresh ingredients from local farmers, Hatchet Hall applies American techniques with wood fire cooking. The interior is composed of casual elegance. There is a hidden bar in the back. It's dark, so reading the menu was a task in itself. 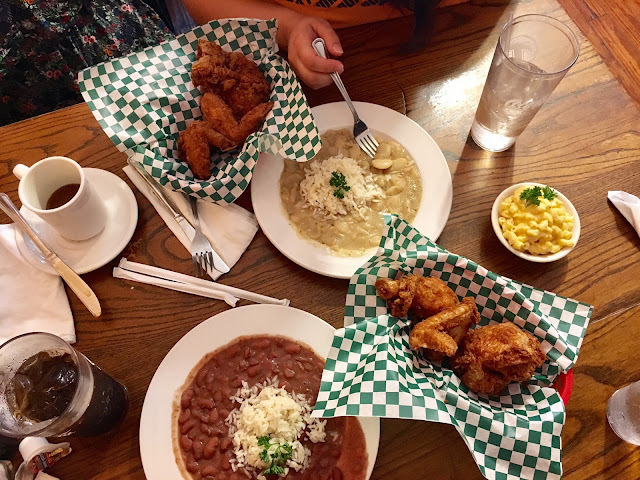 The cuisine almost touches on a bit of the south. It's different and something you don't find at most restaurants. MY FAVORITE DISH. 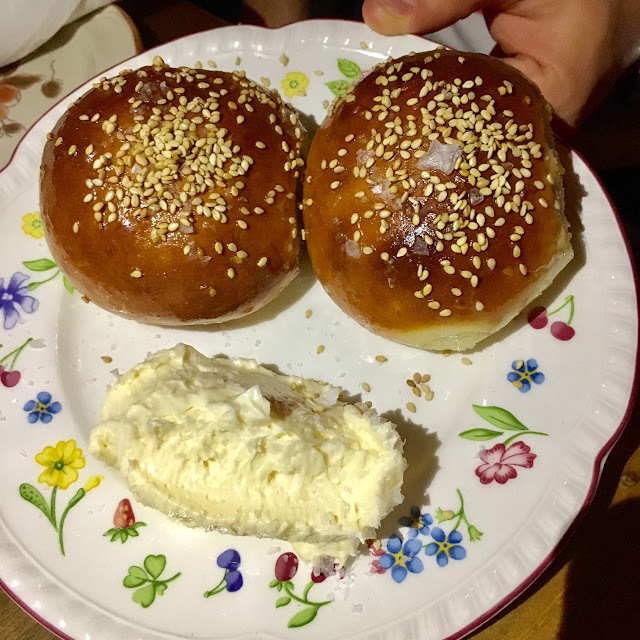 BENNE YEAST ROLLS ($6.00): Honey Butter, Sea Salt. If you're a big fan of bread, you'll love these rolls. They were light and airy and warm and moist...everything you would want in a roll. It was so good and the honey butter melted perfectly onto the roll. It was so delicious that I was sad it only came as a set of two. 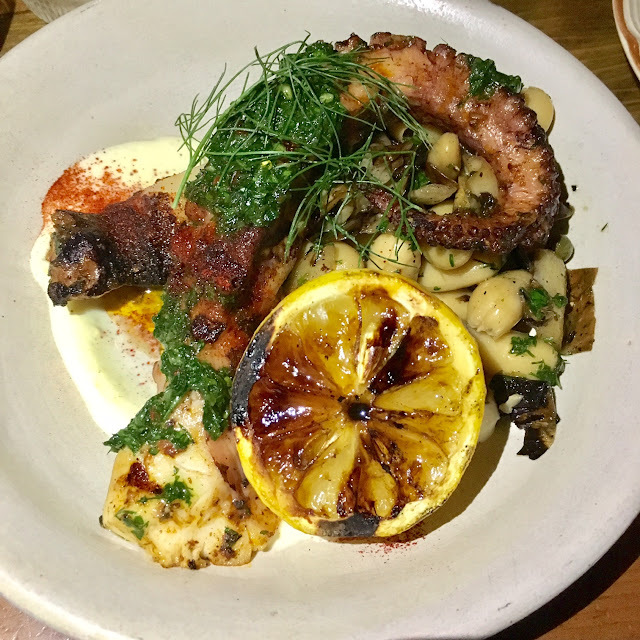 OCTOPUS ($19.00): Cranberry Beans, Treviso, Lemon Aioli, Salsa Verde. The octopus was pretty good. It wasn't overly rubbery and was quite tender. The first time it came out, the dish was quite cold and they actually refired the dish for another, which I appreciated. It had good flavor and I liked the beans a lot. 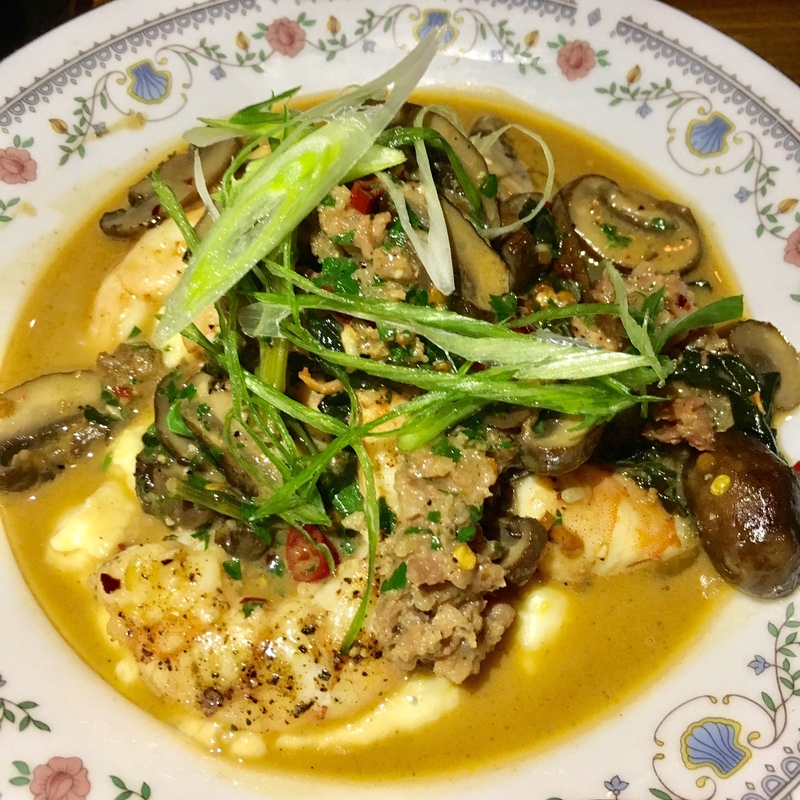 GULF SHRIMP ($17.00): Sausage, Greens, Calabrian Chili, Polenta. This is HH's take on shrimp and grits. I recently just came back from New Orleans and nothing compares to the shrimp and grits there. This is a good take on the dish. The polenta was creamy and the shrimp was cooked well. I liked the little spice from the chili. 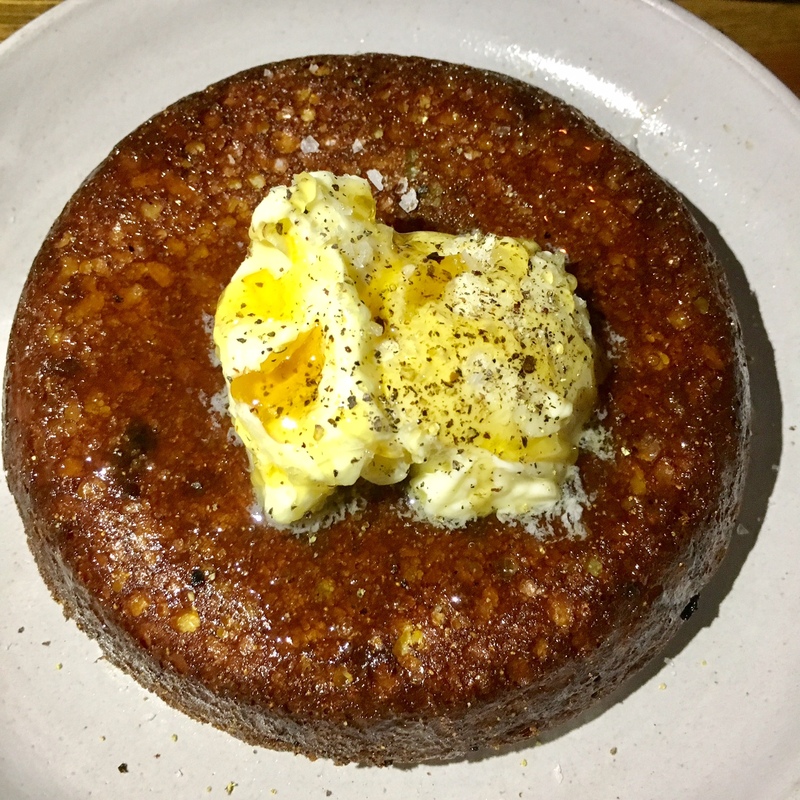 CORNBREAD ($11.00): Jalapeno, Cheddar, Cultured Butter, Honey. This bread was actually pretty darn good. It was moist and the butter went well with the cornbread. It looked burned at first, but that's cause they flipped the cornbread over. 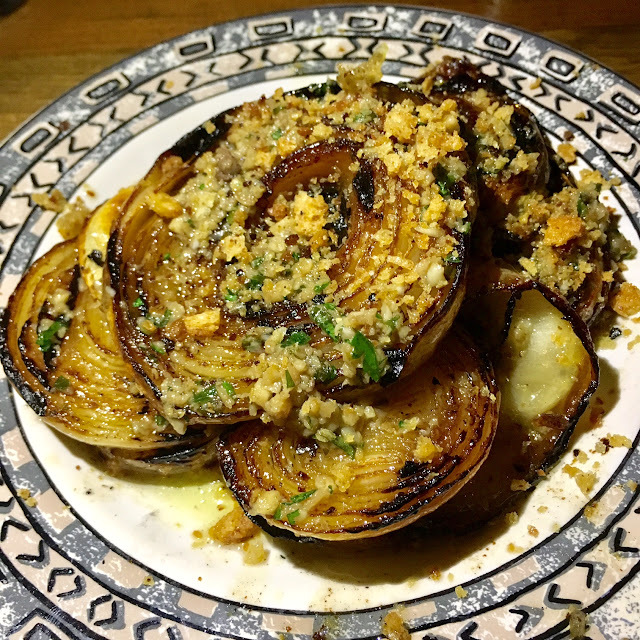 GRILLED SWEET ONION ($8.00): Bagna Cauda, Lemon, Bread Crumbs. I loved these onions. This was probably my second favorite dish. It was sweet and had so much flavor. I loved the garlic. It is a must order. Duck (I forget the price cause it was a special). The duck was just ok in my opinion. It was a little dry and I felt like it lacked some flavor. 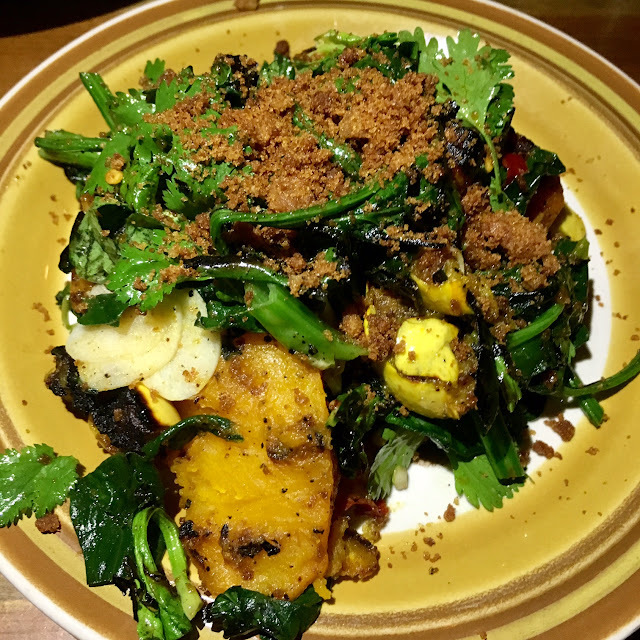 It's probably best to skip this dish and order something else. 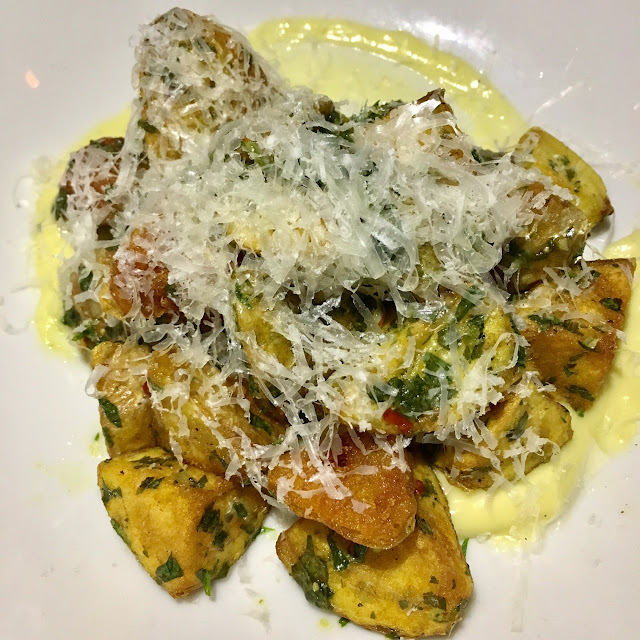 BEEF FAT POTATOES ($8.00): Roasted Garlic Aioli, Salsa Verde. The potatoes were crispy on the outside and moist on the inside. The aioli was great. I don't think the potatoes were anything spectacular. They were just good. WINTER SQUASH ($8.00): Calabrian Chili, Mint, Gingerbread. This dish was pretty good. I actually enjoyed the touch of gingerbread. 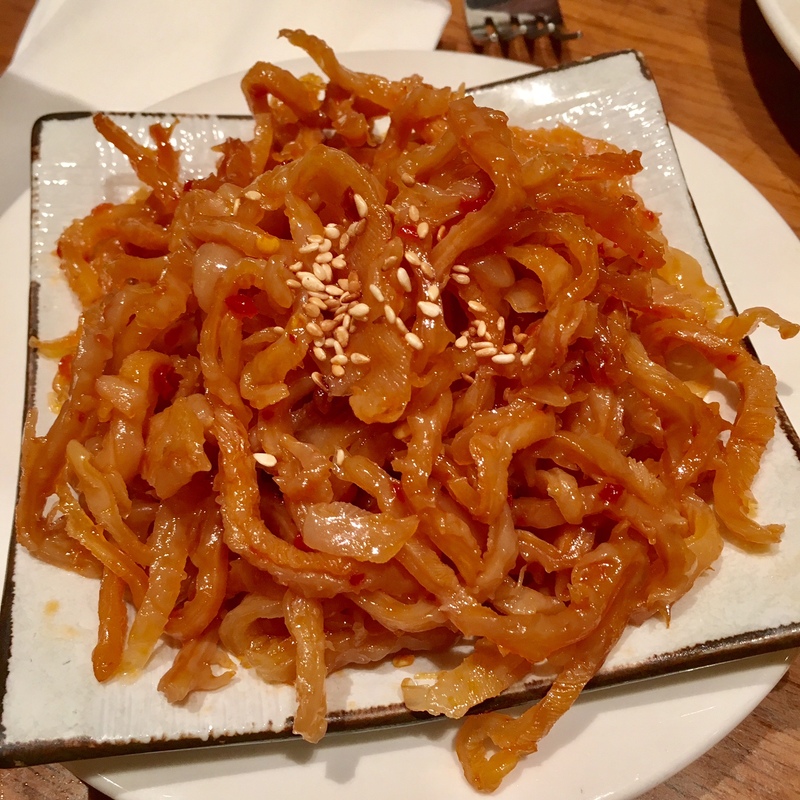 Of the side dishes, I would pick the sweet onions over this. Overall, Hatchet Hall has some good potential. I thought the food was decent, but it didn't blow me away. The yeast rolls that they have are amazing, but they make them in limited quantities. I think it does a good job for being a cool local eatery serving food that is Southern inspired. There is valet parking and street parking, though the street parking maybe a little difficult to find. 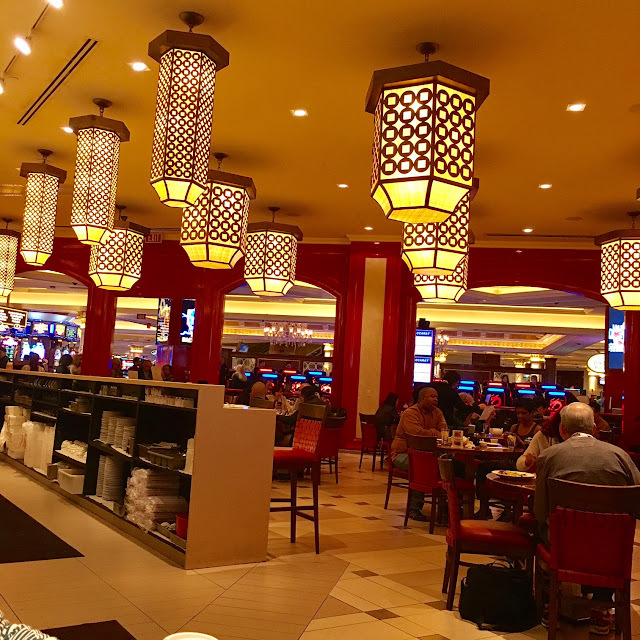 For a good decent Chinese meal on the Strip in Vegas, it seems it would be hard to find. Somehow, with the help of some good friends who grew up in Hong Kong, I have managed to find something as authentic as you would find in HK (I mean, look at the Chinese peeps standing in line to eat). 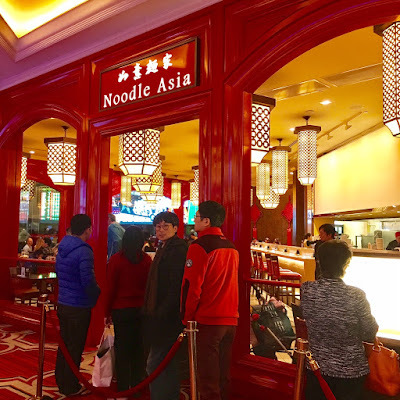 Located inside the Venetian hotel, Noodle Asia serves authentic noodles and Dim Sum. 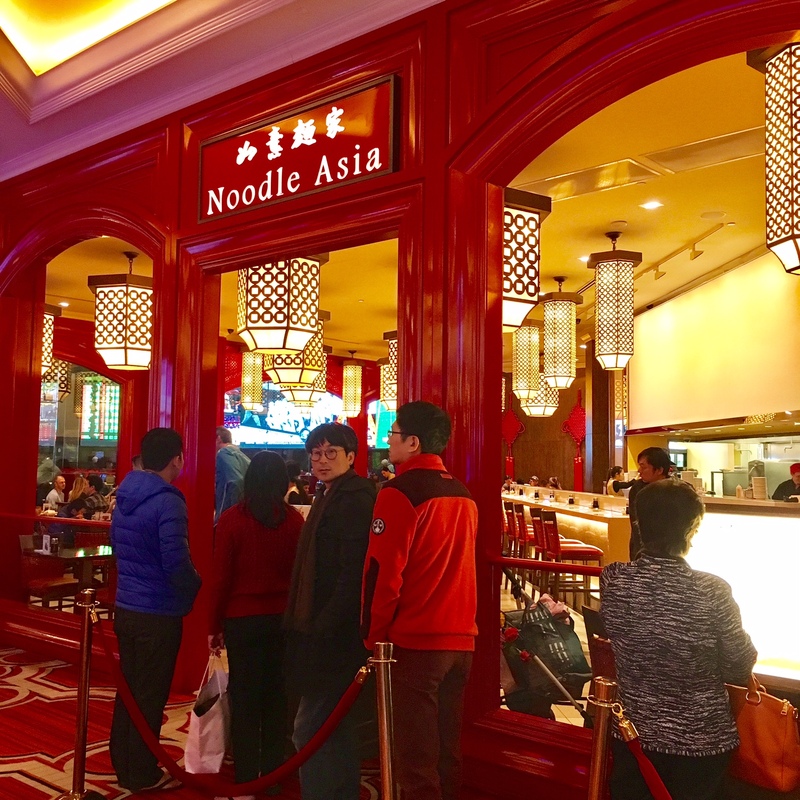 The flavors are pronounced and the noodles range from beef noodle soup to Singapore vermicelli. 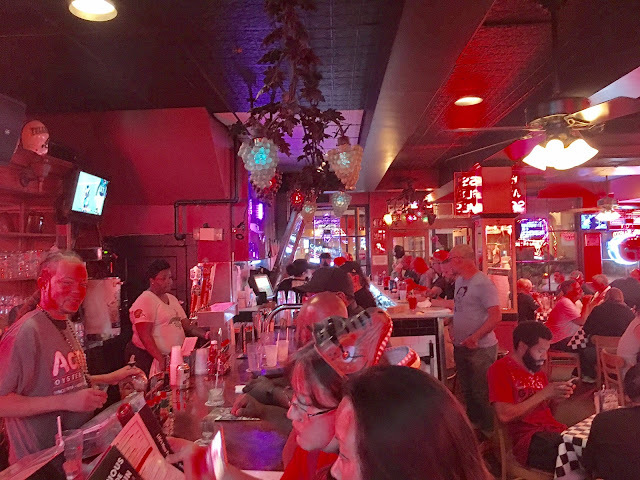 It is a casual spot and especially good for those late night hangovers (it is open til 3am) or the morning hangovers. Just have a bowl of noodles or congee, and you'll be golden for a few more hours of partyin' in Vegas. MY FAVORITE DISH. 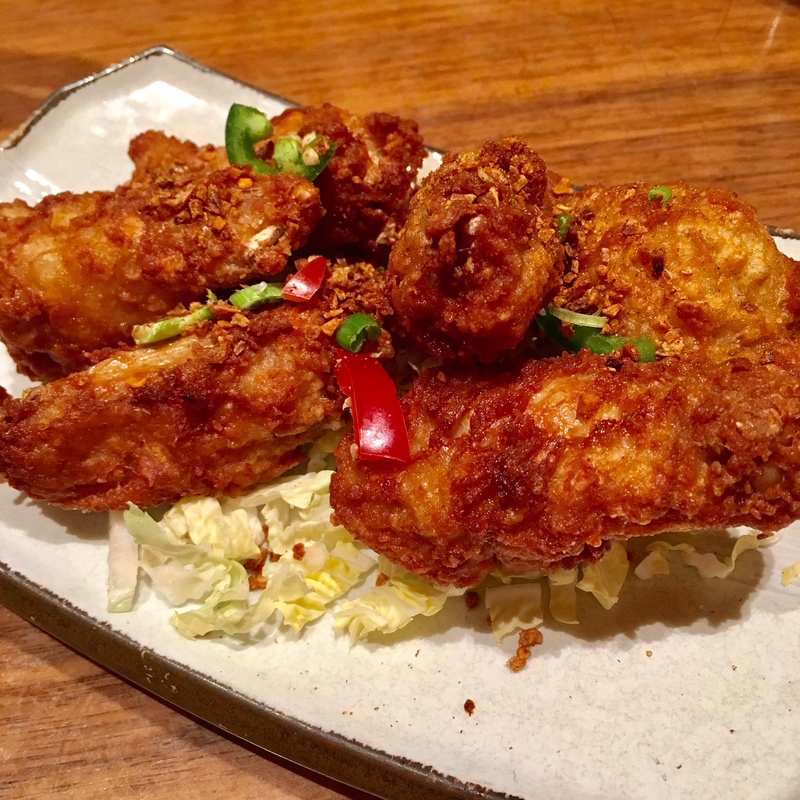 FIRE HOUSE CHICKEN WINGS (6 FOR $9.95): These chicken wings are bomb! They're super crispy on the outside and moist and juicy on the inside. There is a bit of heat, not the type of heat that you would get from the South, but the Chinese way. I mean, I seriously could eat these wings all night long while watching some Lakers basketball. JELLYFISH SALAD ($9.95): This was just ok for me. It was a little spicy, cold the way it should be, but it just didn't taste as fresh as I would've liked. 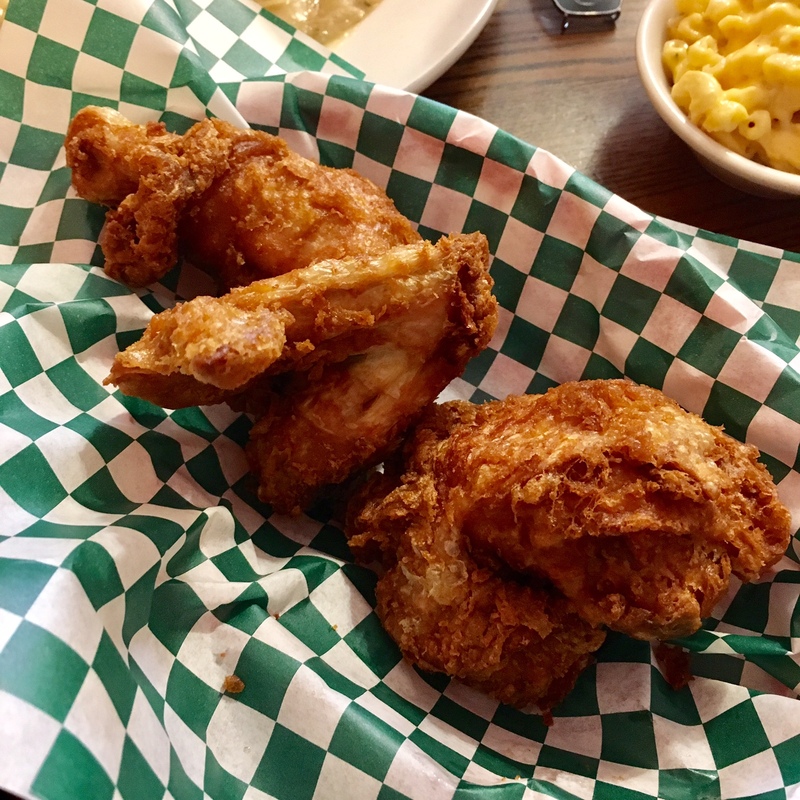 It's worth just ordering two sets of wings and skipping on this. 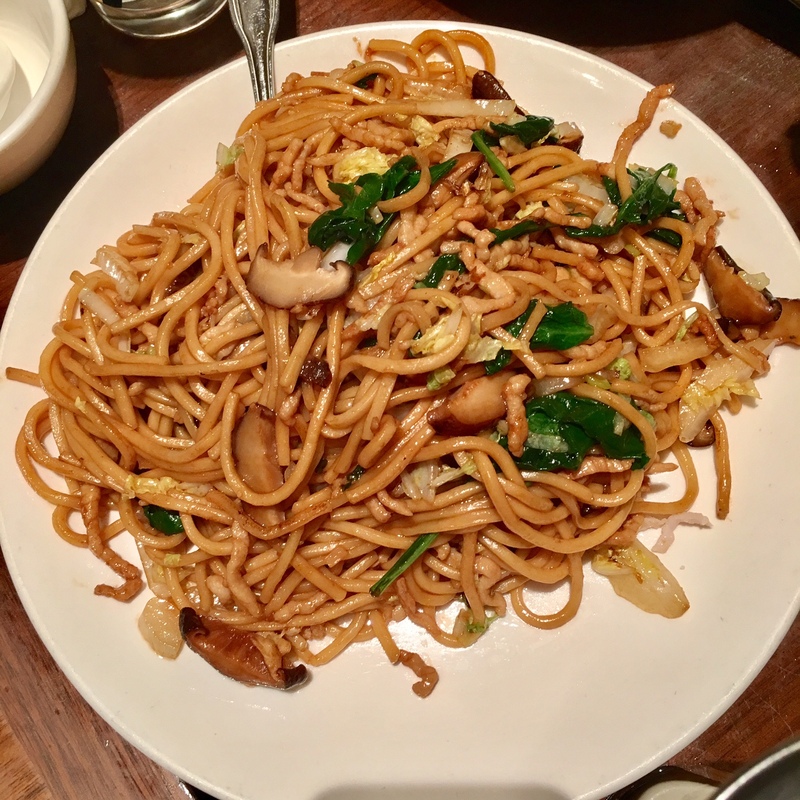 SHANGHAI NOODLES ($14.95): Stir-fried Napa Cabbage, Black Mushrooms, Spinach and Pork. These noodles are amazing. I mean, it's pretty simple and a staple at most Chinese restaurants, but it was so freakin good this morning. It was especially better when it was doused in chili sauce that you ask for. The noodles were cooked to perfection and the cabbage added a nice crunch. It was earthy, hearty, and tasty. SZECHWAN BEEF ($14.95): This was probably my second favorite dish. 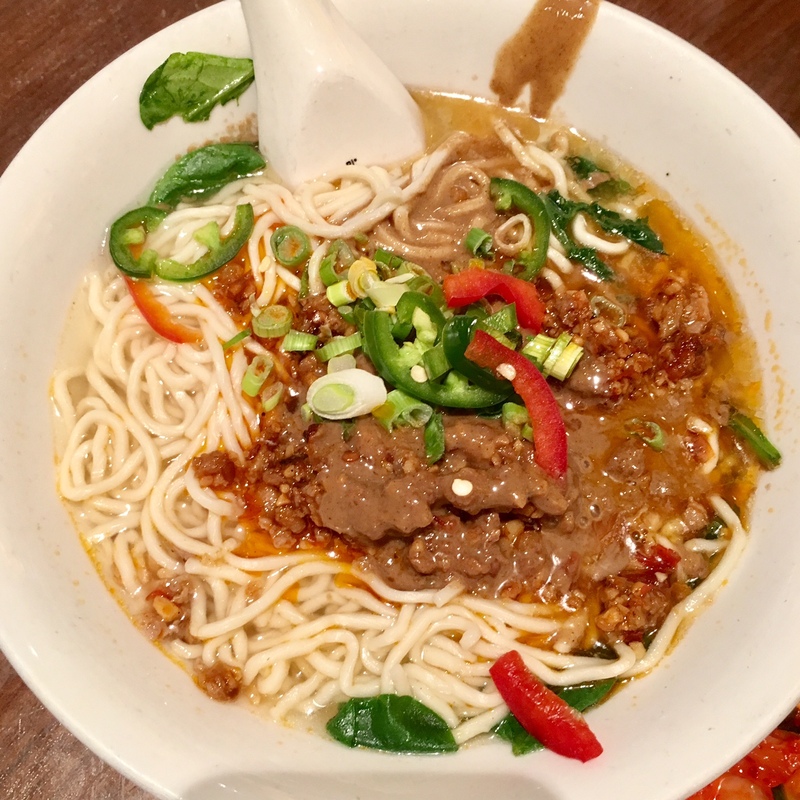 There was a bit of spice and it was cooked like a traditional Taiwanese beef noodle soup. 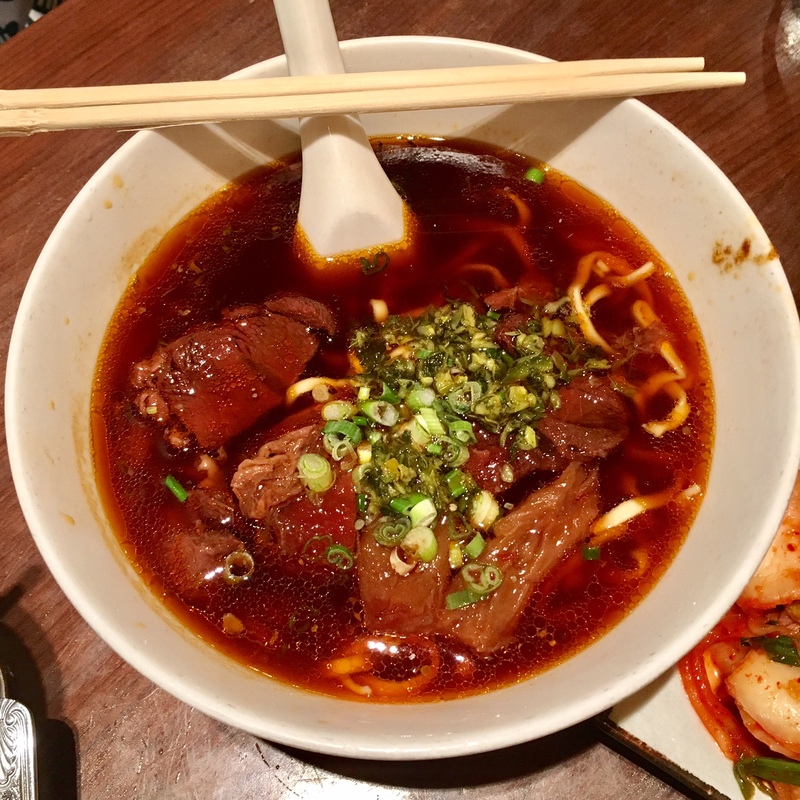 The noodles were perfect and the beef were super tender. It's a must order when here. 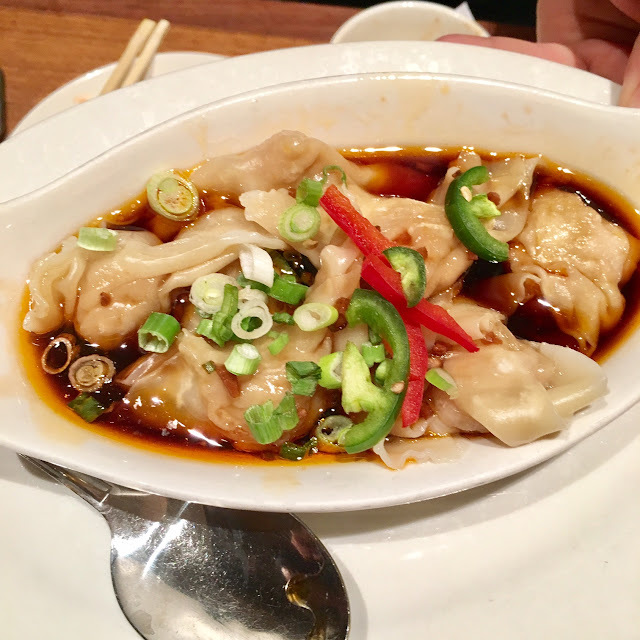 RED WON TONS (8 FOR $8.95): Tossed in Szechwan chili, garlic sauce, pork fillings. This was delicious. The wonton wrapper was tender and the pork held up well to the sauce. I thought it was decent and a bit of a step down from the Din Tai Fung wontons, but hey, you're in Vegas. DAN DAN NOODLES ($13.95): Sauteed spicy peanut, sesame, minced pork sauce. This was probably one of my least favorite dish. It was too soupy in my opinion and not a traditional dan dan noodles I am usually accustomed to. It felt a bit flavorless compared to all the other dishes we ordered. I would skip this and order the beef noodle soup. Overall, Noodle Asia is a legit Chinese restaurant. 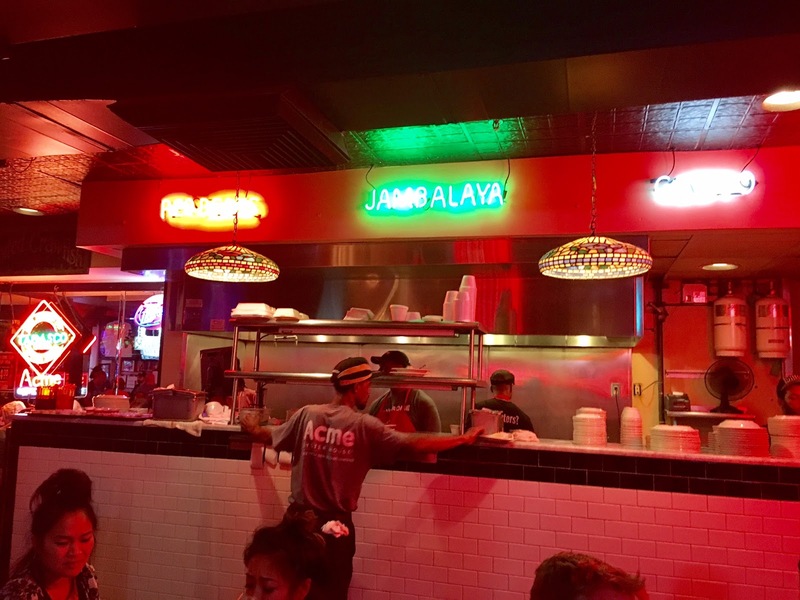 It is a great go-to place if you want something not too fussy. It is Chinese food with a burst of flavor. I thought most of the dishes were comparable to what you find in the SGV, which is saying a lot. The cooks are Chinese and a lot of the customers are Chinese which speaks for itself. Beignets are these amazingly delicious French style donuts shaped in a square covered with powdered sugar. 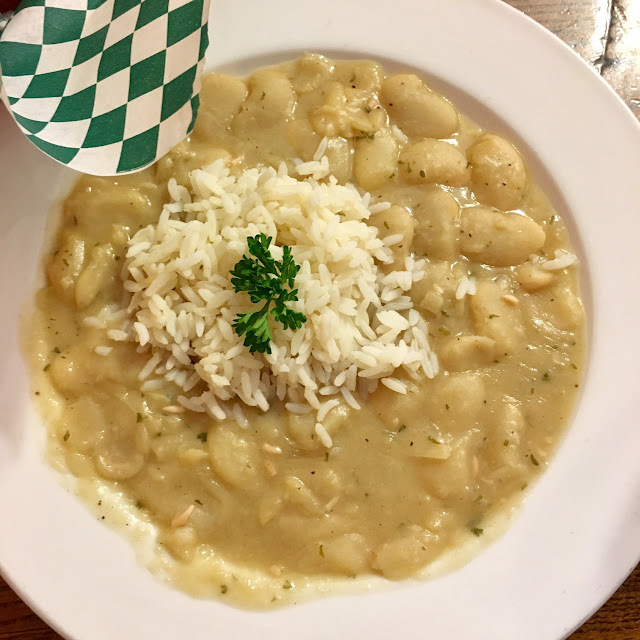 It is a Southern favorite and a must-have whilst in New Orleans. Cafe Du Monde is a cafe serving up these yummy bites 24 hours a day, 7 days a week. The original one was established in 1862. 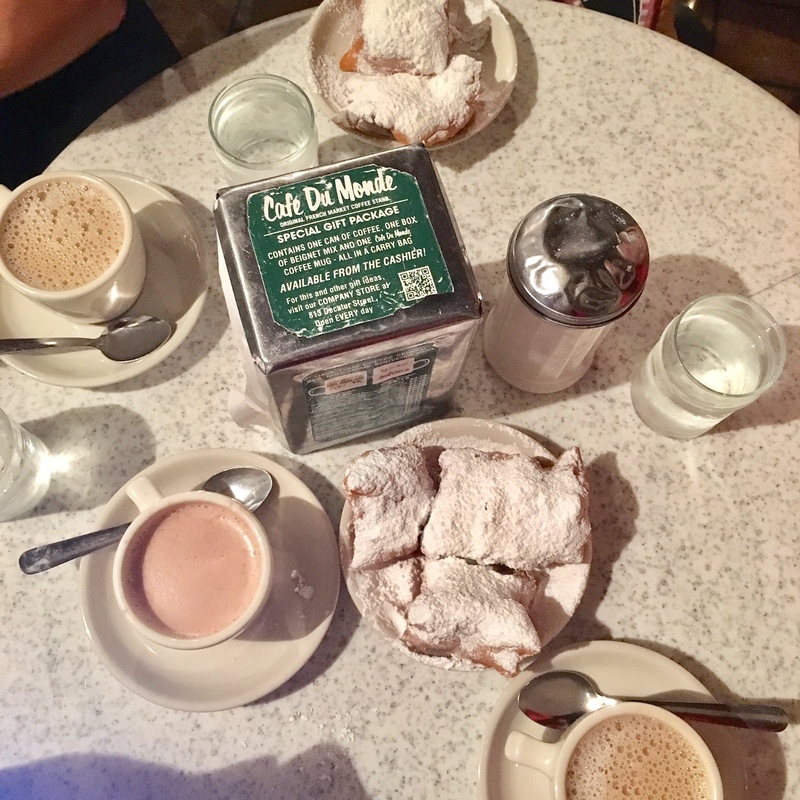 It has a menu that consists of beignets, coffee, hot chocolate and milk. 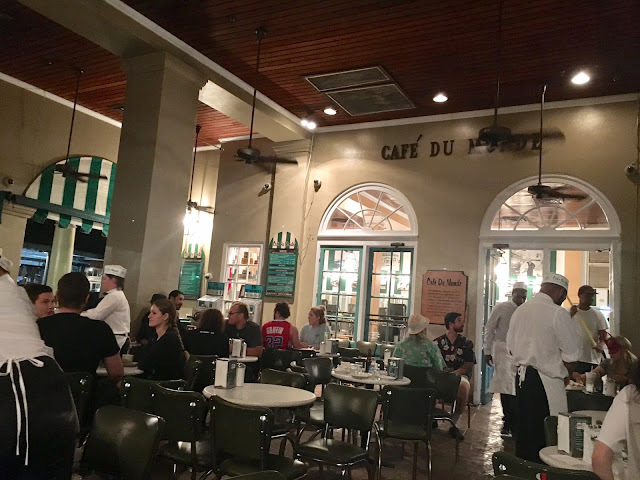 Their signature drink, the cafe au lait is served with their signature chicory coffee mixed with half and half and hot milk. CAFE AU LAIT COFFEE ($2.73 FOR SMALL): The coffee was ok for me. It wasn't too strong and it almost tasted watered down. I guess I've had better cafe au lait's in my life, and this place wasn't my favorite. 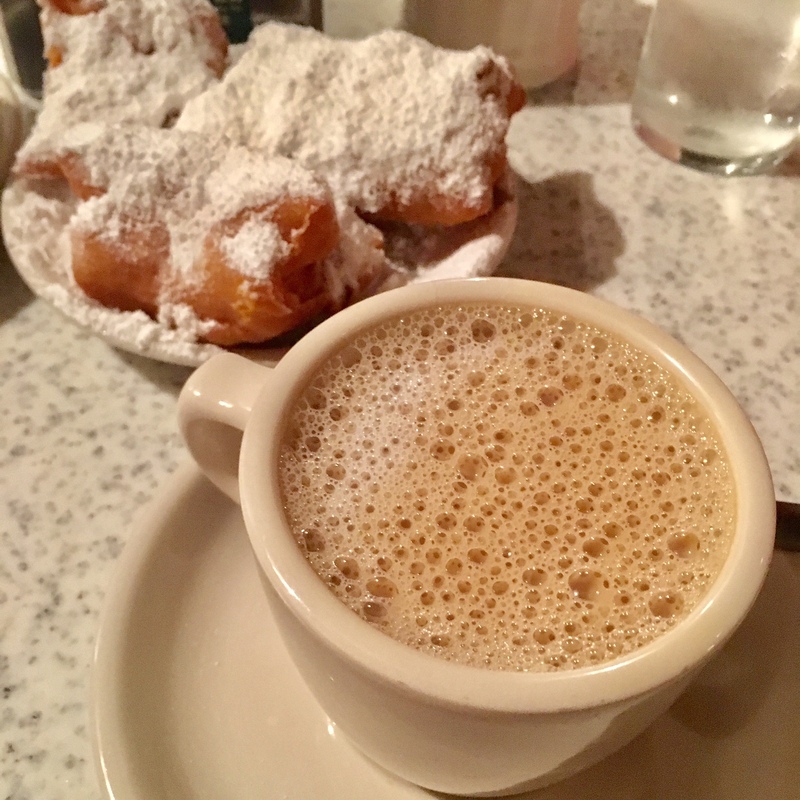 It did go well with the beignets so you can get one and try for yourself. MY FAVORITE DISH. 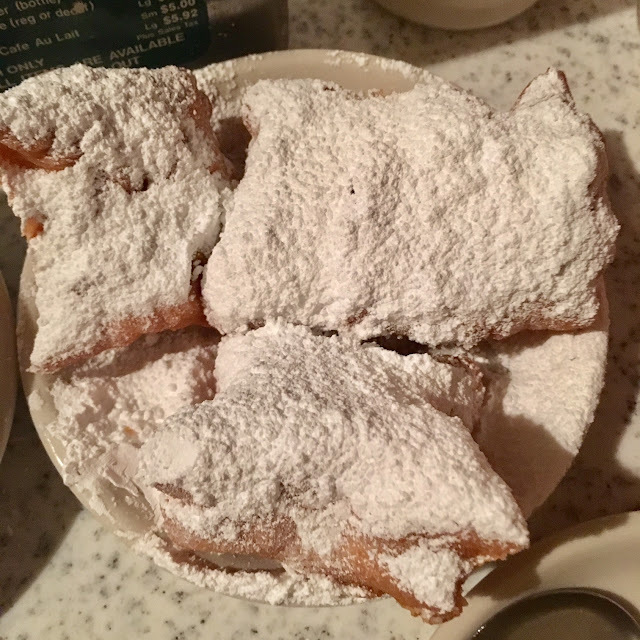 BEIGNETS (ORDER OF 3 FRENCH DOUGHNUTS-$2.73). 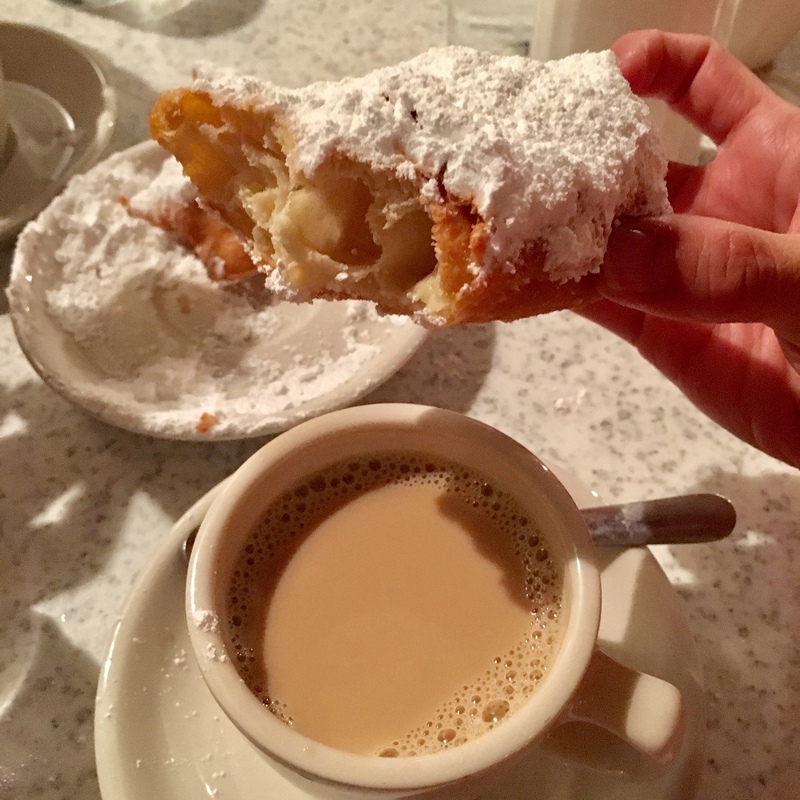 The beignets were actually really good. It wasn't piping hot when we got them. The exterior was crispy while the interior was light and not too dense. I didn't realize I loved things covered in powdered sugar so much. Definitely try this out! Overall, Cafe Du Monde is pretty legit. The beignets were delicious and I now know why this place is famous. I thoroughly appreciate how it's open 24/7, which helps for those late night munchies. This location is outdoor seating. The bathroom is pretty horrendous. The service is quick and easy, paying at the time of the order. For a quick, easy, delicious breakfast, snack, or dessert, this is a winner. For an oyster house, man, this place is freakin popular! 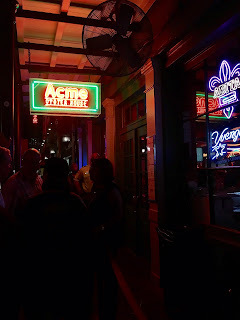 Acme Oyster House has a line that goes way out the door and we seriously waited an hour or so to be seated (you actually have to wait in line rather than give your name and wait to have your name called). 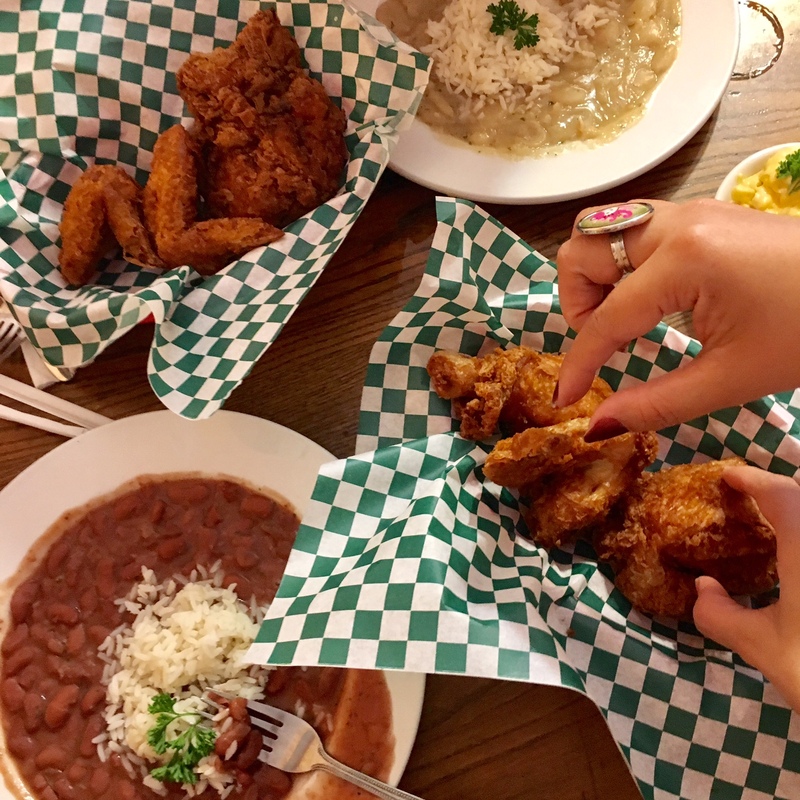 The place is iconic serving up oysters and Southern flare since 1910. 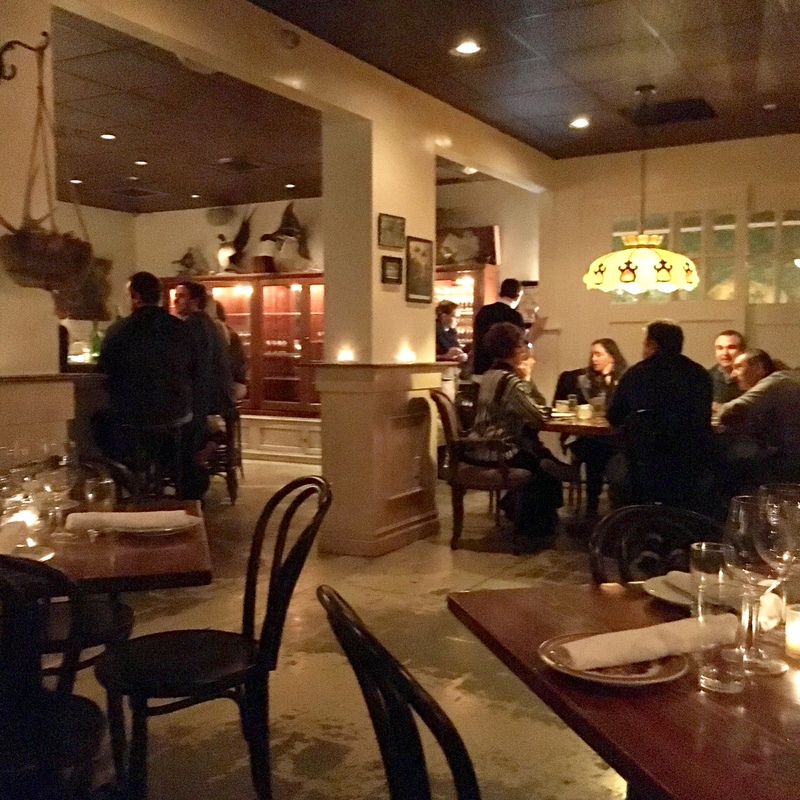 On the interior, the restaurant is pretty casual. There's a large bar where people can sit and be served the full menu that includes yummy fresh oysters or chargrilled oysters. Personally, I love their chargrilled oysters, which happens to be their speciality. 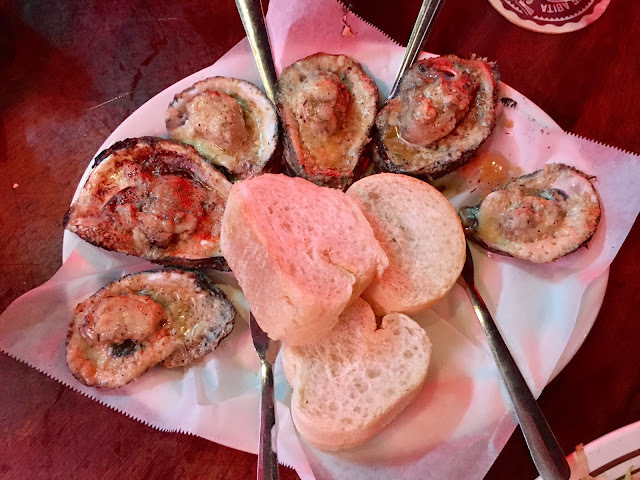 For those who don't like the texture of oysters, this is the way to go (even my friend who doesn't like oysters thought this was pretty good after I forced her to eat them). 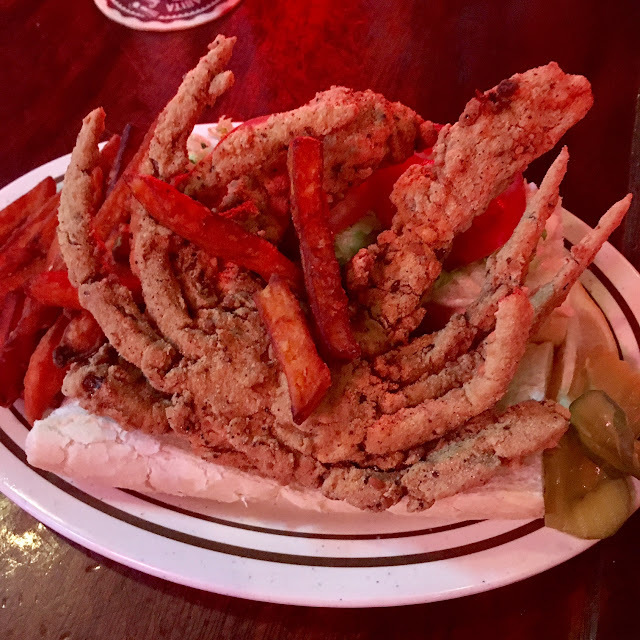 FRIED SOFT SHELL CRAB PO-BOY ($16.99): Served with French Fries. I actually didn't like this po-boy. It was my first time having an authentic po-boy and unfortunately, it didn't have a lot of flavor for me. Don't get me wrong, I feel like this could be mighty tasty. Maybe I just didn't love the soft shell crab (although it was fried to a perfectly crisp texture). I loved the bread but I probably should've picked fried shrimp instead. You do need to put a ton of hot sauce to bring out the flavor. SIDE OF JAMBALAYA ($3.99): This was actually pretty good. 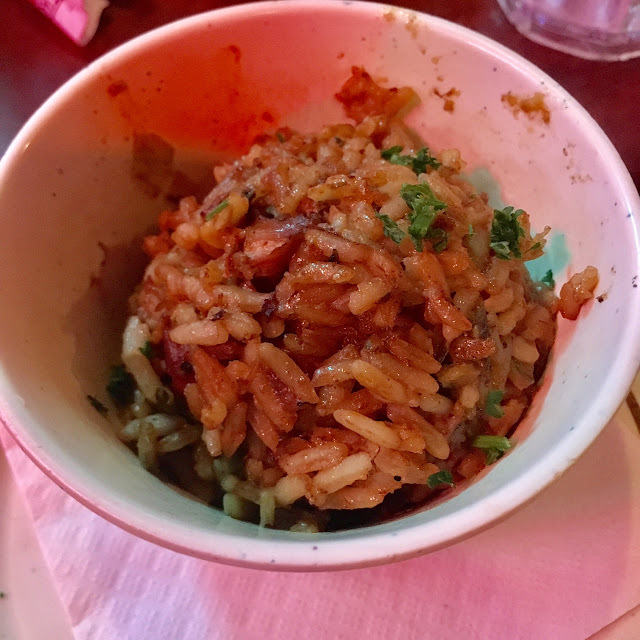 It was packed with Creole spice with a bit of heat. For rice, this packed tons of flavor. I thought it was worth trying. MY FAVORITE DISH. CHARGRILLED OYSTERS ($11.99- 1/2 dozen): Sizzing Chargrilled Oysters Saturated in on Herb Butter Sauce, Topped with a Special Blend of Cheese. This was amazing! No wonder peeps wait so long in line for this specialty. It's not slimy like raw oysters or rubbery like how something is cooked. 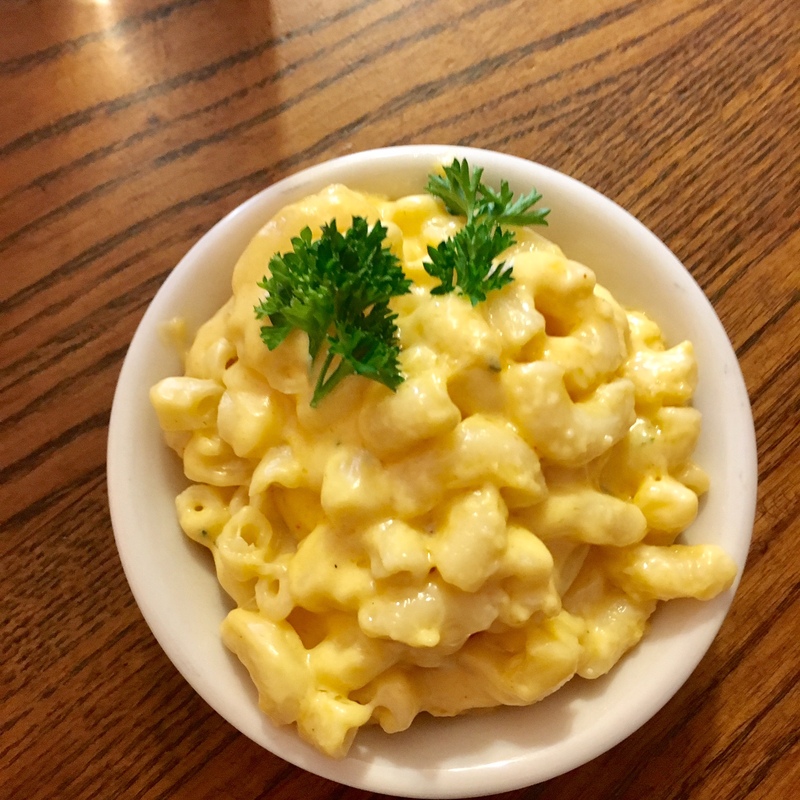 The texture is unique and what you taste most is the blend of butter and cheese and all that yummy goodness. It's served with bread so you can soak up all that butter that the oysters are cooked in. So freakin good! 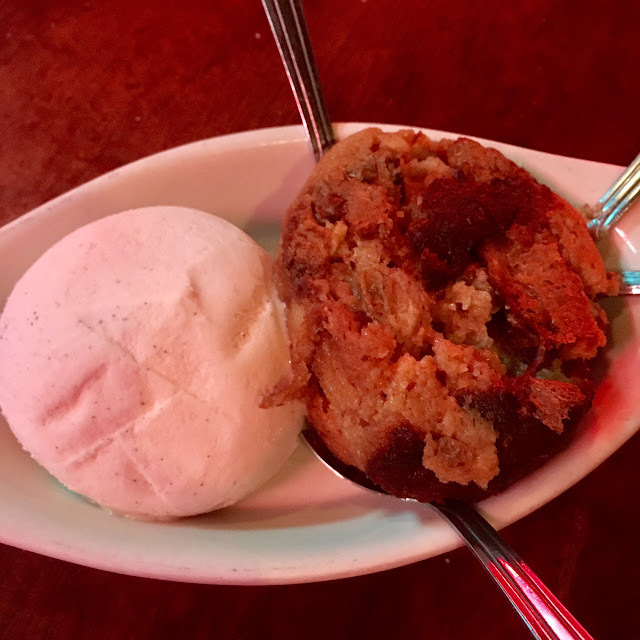 NEW ORLEANS BREAD PUDDING ($5.99): With Whiskey Sauce. This was really good and probably my second favorite dish of the night. The pudding was warm and gooey and the ice cream that was served with the pudding cooled off the steam. It was a perfect combination once that whiskey sauce was poured all over this deliciousness. Amazing! Overall, I understand why this place is famous. 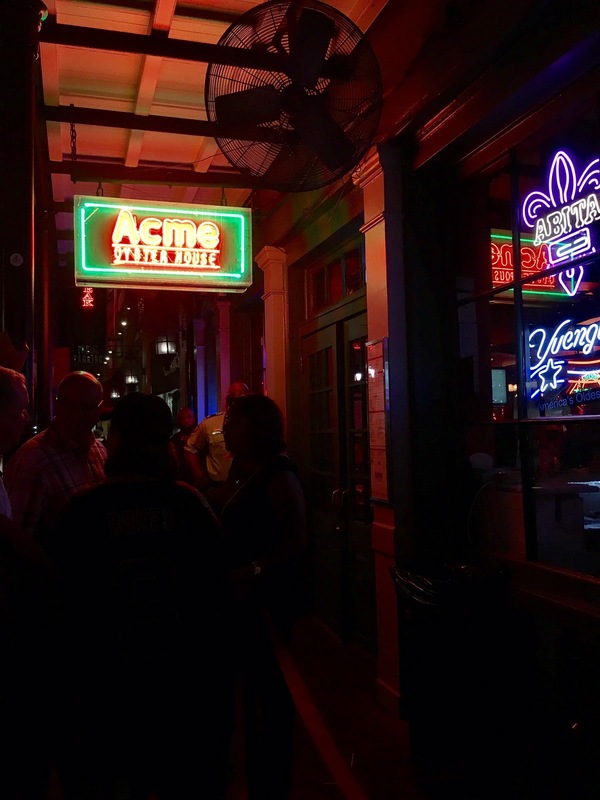 Acme Oyster House has one, if not, the best chargrilled oysters. It is succulent, delicious and packs ton of flavor. I thought the other dishes were ok, with the exception of the bread pudding. The stranger next to me allowed me to try their Boom Boom Shrimp, which was actually really good as well. If you just want oysters, this is the place to go...just be prepared to wait in line!